We’d love your help. Let us know what’s wrong with this preview of The Perfect Egg by Aldo Buzzi. 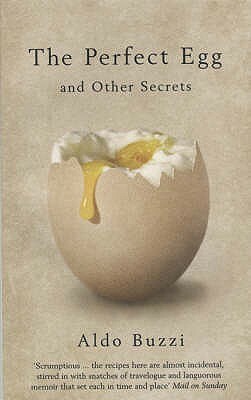 Scholarly, playful, idiosyncratic and witty, Aldo Buzzi's 'The Perfect Egg' is an excursion into the food that has obsessed, provoked and intrigued the author through his life. To ask other readers questions about The Perfect Egg, please sign up. Finalmente qualcuno che mi ha spiegato come fare un uovo al tegamino! Non mi è mai riuscito benissimo, ora so perché. Il libretto alterna piatti esotici e bucatini all'amatriciana, ricettari dell'antica Roma e risotto alla milanese. Molto carino, scorre velocissimo ed è un'ottima scelta per un momento di relax. This is not recipe-heavy, though if you flip through it, it may seem that way. I read this cover to cover in an hour or two; I have decided to make a fried egg with leeks and artichoke soup. The writings are simple and charming and short; perfect for travel reading or for a cook between serious books. sweet, wandering little essays on food and everything else. various recipes of dubious application, but this seems like a side point. This is a bizarre collection of essays by modern tastes, but I enjoyed Buzzi's revelations about simple things. passion, love, chauvinism, none-too-impeccable hygiene, and only the very best of meals had by the good people. What's not to love? Lettura piacevole, colta e, ovviamente, da far venir e l'acquolina in bocca. Deludenti le illustrazioni di Steinberg, decontestualizzate e mal riprodotte. Very enjoyable, rambling collection of all sorts of food trivia and rather weird recipes, many of which I would probably never try. Aldo Buzzi was an author and architect. Buzzi graduated from Milan School of Architecture in 1938. Though primarily an author of travel and gastronomy books, he also worked as an architect; as assistant director, scene writer, and screen writer for various film production companies in the former Yugoslavia, and in Rome, Italy, and France. He edited the following films: La Kermesse heroica, Ridolini Aldo Buzzi was an author and architect. Buzzi graduated from Milan School of Architecture in 1938. Though primarily an author of travel and gastronomy books, he also worked as an architect; as assistant director, scene writer, and screen writer for various film production companies in the former Yugoslavia, and in Rome, Italy, and France. He edited the following films: La Kermesse heroica, Ridolini e la collana della suocera e Ridolini esploratore, and Sette anni di guai, all produced by Editoriale Domus, 1945.